Tonight on ABC is an all new episode of GREY’S ANATOMY. Tonight’s show is called “I Was Made for Lovin’ You” and on tonight’s show ‘the doctors’ romantic relationships take center stage. If you missed last week’s episode we have a full and detailed recap here for you. On last week’s show as the doctors continued with their lawsuit, they’re forced to confront the realities of their injuries. Meanwhile, Bailey tricked Arizona into helping her with a pediatric case, and Cristina tried to find normalcy in her new environment. On tonight’s show Cristina and Owen continue to figure out their relationship amidst the pending lawsuit; and Bailey argues with Ben over plans for their upcoming nuptials. Meanwhile, Callie recruits Jackson to help find a solution to Derek’s hand, but he is preoccupied by a shocking situation with April. Tonight’s episode looks like it is going to be a great episode and you won’t want to miss it, so be sure to tune in for our live coverage of ABC’s “Grey’s Anatomy” Season 9 episode 7 at 9 PM EST! 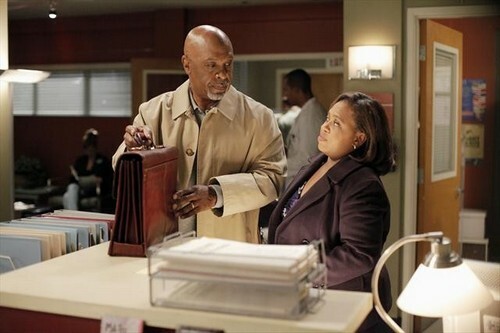 While you wait for our recap hit the comments and let us know what you think of Grey’s Anatomy season 9, so far? While you wait for the recap check out a few pics of tonight’s episode below. Live Recap Here: Tonight’s show begins with Owen talking to the staff about the lawsuit situation and he paints this “we’re a happy family” picture for them, but not everyone is feeling the love or buying the pep talk. Meanwhile Bailey is butting heads with Ben over wedding plans. He seems to want to go ahead with some outdoor Christmas extravaganza while she’s happy with a judge at the courthouse. April is also super stressed. She’s trying to focus on her caseload but finally runs to Jackson and blurts out that she is late and has never been late before in her life. Could it be baby time? Owen has a sit down meeting with attorneys regarding the lawsuit and is asked to start at the beginning and tell pretty much every detail of what happened. Meredith really wants Derek to go ahead with the surgery that may or may not fix his hand. He jokes that he may not have the surgery because then he has a good excuse to work less and fish more. April left her conversation with Jackson and went back to tend to a teenager that was trampled by a horse. I suspect she is throwing herself a little too much into work as she is overzealous about his treatment. Alex is trying to calm her down and balance out her edginess but I’m not sure that’s going to work. Cristina finally corners Owen on why she wanted her back at the hospital She suspects that he might be missing her and their relationship. He informs her that all he wants from her is to be a good doctor and nothing more because they’re better off apart. He then heads back into his meeting where he is grilled about the hospital switching airline companies the year before the accident. Their budget cuts caused them to jump to a carrier with a horrible history of mechanical problems. As Owen starts to flip out asking who signed off on the switch, they show him his signature on the paperwork. April is obviously not good at keeping secrets and she breaks down and tells Meredith her fear of being pregnant. A baby was not in her plans, she was supposed to be married first. Meredith reminds her that plans rarely work out the way that you think they will. Jackson eventually tells her not to worry at all, they can do it, they can raise a baby together. Meanwhile Owen has taken full responsibility for using an airline with a record of mechanical problems and he fully expected to be fired or have to resign. Oddly enough, no one is demanding his resignation and instead the board is backing him fully. Finally April takes a pregnancy test and she finds out that it’s negative. She is sitting with Jackson thanking god out loud that she’s not pregnant and doesn’t have to get married. Jackson looks absolutely crushed by the news. He obviously was digging the idea of a life with her. Meredith catches up with Cristina who admits she wants Owen back. She ponders the notion that she has changed and Meredith tells her that it’s the truth, everything is the same but Cristina is different. The episode ends with Meredith telling Derek they are having another baby because it’s simply meant to be. Tune in next week to see what happens next.